I drive past him every weekday morning. He is waiting 4 houses down from my house at the bus stop with his bike for the 6:30 bus, and I am driving on my way to work. Every day I see him. One day I decided to begin waving to him as I pass by. He seems so familiar; as much a part of the neighborhood as the telephone pole he leans up against every morning. One day as I drove by, I stopped in the middle of the street and rolled down my window and introduced myself. He pulled the earphones out of his ear, lowered his cigarette and told me his name. The other day, I walked down to the bus stop to talk to him and ask a few questions before his bus came. He lives around the corner from me. He works as a mechanic. 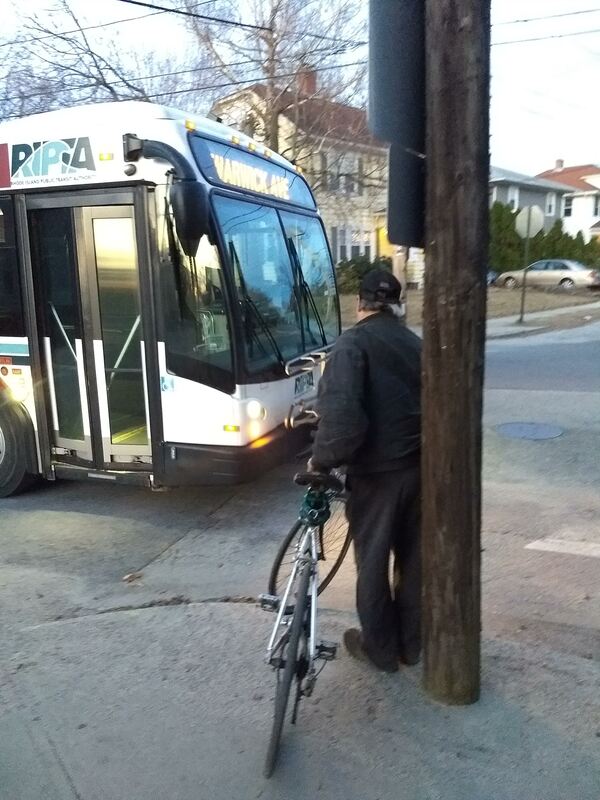 Each morning, he loads his bike onto the bus and takes two buses to get to work. He goes 12 miles in the opposite direction, but the bus is safer, warmer, and more reliable at 6:30 in the morning; especially in winter when he continues to ride. In the afternoon, he rides his bike down Park Avenue because it’s a faster way home. He also only rides on the sidewalk because Park Ave is very busy and narrow; not always a great place for cars, never mind bikes. John M. and Cyndie S.; immediately strike that last sentence from your memory or you will continue to refuse to make that awesome bike ride out and back on Park Ave to ride around the Situate Reservoir with me! The story of Leon is not overly spectacular or grandiose; a neighborhood working man who takes his bike to work each day, however, I’m so happy I took a few minutes to stop and say hello. That’s spectacular enough for me. Leon would make a great character – just sayin’….